Posh oven chips. They're baked in the oven, with a drizzle of olive oil (or whatever type of fat you like) and then sprinkled with garlic, parsley and sea salt straight out of the oven. Lush. I've tried quite a few different types of potato for this and found Maris Piper and red, Rooster potatoes to be the best. 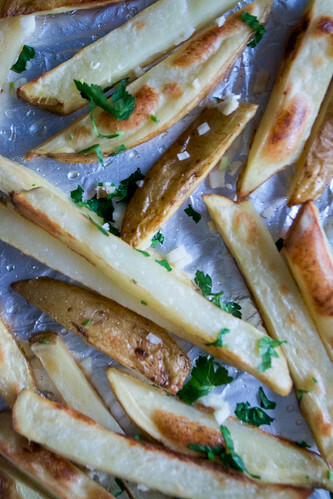 And although you can use olive oil if you like, I've found that beef dripping results in beautiful, crisp fries. Or you could use coconut oil, or vegetable oil. This recipe can be made vegetarian and vegan (just use olive/vegetable oil), and also paleo (use beef dripping, coconut oil or duck fat). Heat the oven to gas mark 6/200ºC. Cut the potatoes into fries, leaving the skin on. Make sure they're all about the same width so they cook evenly. Slide a shallow baking or roasting tray in the oven to heat up, with 2 tsp of your chosen fat. Once warmed - a couple of minutes will do - throw in the fries in one even layer and sprinkle with a little salt, coating them in the oil. Cook in the oven for 25 minutes, or until crisp and sizzling. When ready, take them out and scatter the garlic and parsley over the fries, shaking the tray and allowing it to warm through in the residual heat. Sprinkle with a little more sea salt if needed and serve straight away.